Chad White is coming back to San Diego for a short visit and the workaholic chef could not resist doing a popup party while in town. On November 2, from 6-9pm, the former Top Chef contestant will be taking over The General Store North Park and giving guests a taste of the menu from his new Spokane, WA based ceviche eatery - Zona Blanca. Chef Chad White was a longtime fixture in San Diego's culinary scene before departing America's Finest City in December 2015 to move back to his hometown of Spokane, WA. The young chef was a catalyst in bringing the concept of modern Baja Mexican-style cuisine north of the border and made a name for himself in San Diego & Mexico with his eclectic urban style and Baja-influenced food. Before departing, he operated East Village restaurant Comun Taqueria, which closed in late 2015. He also is a partner in La Jolla's Craft Pizza Co. and Tijuana's La Justina. Chef White was a contestant on season 13 of Bravo's Top Chef. White opened ZONA BLANCA ceviche bar this year in Spokane and is currently working on a larger scale restaurant - Native Post & Provisions - a concept which is still very much in development. Chad White is returning to America's Finest City to visit family and attend/cater his friend and former San Diego chef George Morris' (formerly of Beaumont's) wedding. He couldn't pass up the chance to give his fans a taste of what he's been doing. 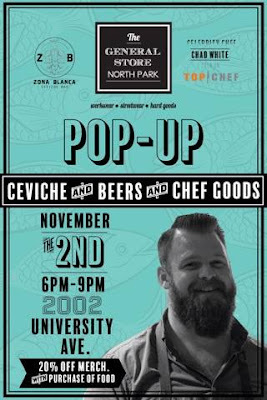 At the November 2 free-to-attend, pop-up event, Chef White will be serving up samples for purchase of his new ceviche recipes, and possibly even some Dorilocos (think Doritos smothered with Mexican flavors). There will also be craft brews for sale from an area brewery and a DJ spinning beats. With the purchase of ceviche, all store items will 20% off. "It's just gonna be a fun party," said Chef White. "All are welcome! I will be making ceviches that I make at Zona Blanca - my newest eatery in Spokane." The General Store is located at 2002 University Avenue in North Park.